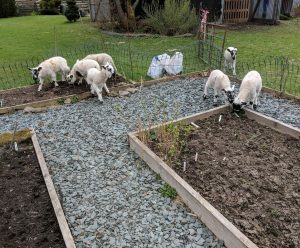 Having reached the 5th anniversary of our move from suburbia to a North Pennines smallholding, it’s clearly a good time to review the current situation and take stock of our progress so far. Not least of which is where did all those years go! 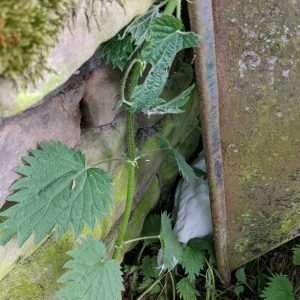 The first task for me was to look back at my older blog posts from previous anniversaries and they were surprisingly informative. A little naive in places perhaps but that’s to be expected with hindsight and I’m sure that some of my more recent updates will look much same when I review them in the future. Apparently after just one week in our new 15 acre home we were already thinking of options and making plans. However reading that post though again now, some aspects don’t match the actual events so that’s a good illustration of how plans will change as you go along! The one constant from our initial arrival is the collection of white chickens (breed uncertain) that we agreed to keep on from the previous owners. Although the cockerel has long since gone, the remaining hens still occasionally disappear off in random places to sit on some eggs until we can track them down. The 2nd anniversary was marked by the dramatic events when the Dexter cattle made their big entrance before eventually settling down. At the time a real low point for me but now I’m not sure I would want to be without the Dexters plus the beef is absolutely amazing! 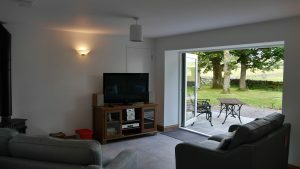 Around this same time, we also decided to convert one of the stone barns into a 2 bed self catering holiday let and this has turned out to be very popular. There’s a bit more work involved in running this than we might have original expected but it’s still very rewarding and we’ve had a constant stream of lovely guests staying. 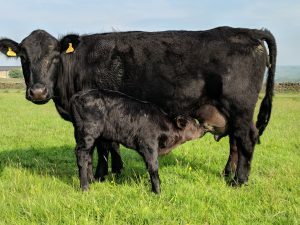 By the 3 year smallholding anniversary it was becoming clear that we were doing more with livestock than I’d originally anticipated. 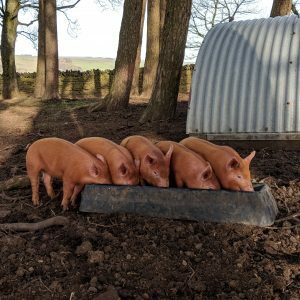 Along with the obligatory chickens for eggs, we also had 2 Tamworth sows for breeding plus the Dexter cattle were happily calving unaided each year. Now that the 5 year mark is here you can tell we’re getting more confident or perhaps that should be over-confident. Despite our carefully thought out plans for managing the workload, we’ve decided to try keeping a few orphan lambs this year but at least these are just for meat with no intention for long-term breeding. This approach was certainly underlined for me when they decided to invade my raised beds and caused all sorts of havoc. In general this is a nice way to try keeping a different type of animal for a few months but it’s not cheap with milk/feed costs and I’m still not convinced that I’d keep any sheep as a longer term activity. It’s been a huge learning experience and immensely enjoyable most of the time with just the occasional negative moments. Even during the bad times though, I only need to take a wander around our fields and woods or just sit with the animals for a while. This whole adventure has only been made possible through the help of our neighbours and the many new friends we’ve made since we started this journey. I’d be the first to admit that without that help and support we would not be where we are today. Congratulations. Much to inspire those like us who are still at the small polt, small ideas stage!